Bargain your cheap flights to Bulawayo in assistance with travel professionals. 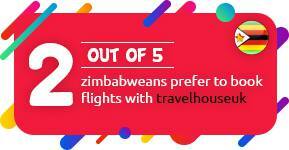 Travelhouseuk offers a wide range of fairly compared comparisons of flexible airfare exclusive deals for Zimbabwe and its popular cities. If you are looking for flights to Bulawayo, Jump in to the search to check the air tickets from UK to Bulawayo, by major airlines. Scribble your travel details and get fixed the itinerary at the price your budget allows so far. Which Airlines Operate Flights To Bulawayo From UK? Which Airlines Fly Non-Stop To Bulawayo From UK? There are currently no non-stop flights for Bulawayo from the UK. Only connecting flights are available from the major airports, of which the majority are code-shared. British Airways, South African Airways, Virgin Atlantic, Lufthansa, and Air France are the top operators of connecting flights to Bulawayo from the UK. What Is The Flight Duration From UK To Bulawayo? The minimum flight duration from London Heathrow to Bulawayo is 15 hours and 10 minutes. Virgin Atlantic and South African Airways operate these flights on a code-share basis. Johannesburg is the stopover. From London Gatwick to Bulawayo, it takes 18 hours and 10 minutes minimum on a three-stop flight via Bordeaux, Frankfurt, and Johannesburg. These flights are operated by British Airways, Lufthansa, and South African Airways (code-shared). The flight duration from Manchester to Bulawayo is 16 hours and 10 minutes on code-shared flights with Lufthansa and South African Airways via Frankfurt and Johannesburg. From Birmingham, it takes 16 hours to reach Bulawayo. Lufthansa and South African Airways offer code-shared flights via Frankfurt and Johannesburg. The total flight duration from Edinburgh to Bulawayo is 15 hours and 55 minutes. Flights are code-shared between Lufthansa and South African Airways and fly via Frankfurt and Johannesburg. Are There Any Flights To Bulawayo From London Heathrow? Flights depart daily from the London Heathrow Airport en route to Bulawayo. All of these are indirect flights. Airlines offering flights to Bulawayo from London Heathrow are South African Airways, Emirates, Virgin Atlantic, British Airways, Ethiopian Airlines, and Kenya Airways, among others. Except for South African Airways, the majority of flights are code-shared between different airlines. Does South African Airways Fly To Bulawayo? Yes, South African Airways is a major airline operating flights to Bulawayo from London Heathrow. The airline currently operates indirect flights for Bulawayo via Johannesburg. For one-stop flights to Bulawayo, South African Airways is a good option as it offers an overall excellent flight experience and value for money. To book your next flight with South African Airways, give us a call or sign up for our newsletter to keep track of discounts. Which Is The Main International Airport In Bulawayo? The Joshua Mqabuko Nkomo International Airport is the main international airport in Bulawayo. At an easily accessible distance of 15 kilometres from centre city Bulawayo, you can reach your hotel in a taxi or a private hire. BUQ is the IATA code used for this airport. When Is The Best Time To Visit Bulawayo? The peak season for tourism starts around March. An overall mild climate keeps your options open for outdoor adventures and sightseeing. From March to May, the average temperature sticks around 18 C. Summers are also good for travelling to Bulawayo, however, keep in mind that the summer months here are August, September, October, and November. Summer takes its time to set in, so weather is likely to be pleasant in August and early September. What Are The Main Tourist Attractions In Bulawayo? Primarily known for its several balancing rock formations and cave art, the park is also home to a good number of animal species. See if you can spot the white rhino and the black one too. The park is home to both of these rare species. It is a complete day-trip so plan ahead. Major museums include the Museum of National History, one of the largest museums in the southern hemisphere. Second is the Railway Museum, for which old steam locomotives were restored and have been exhibited ever since. Both museums are popular sites for school field trips and can be great for a family's day out. When it comes to the oldest establishments marking the city, this UNESCO World Heritage Site has artefacts dating back to the Stone Age. Ruins consist of weathered terraces and walls of granite that overlook the Khami Dam. To get a good look of the outskirts of Bulawayo, you can head over to Malindi Dzimu. Popularly known as the 'view of the World', it provides a dramatic picture of granite formations.